Current building code devotes a considerable amount of instruction designed to improve dryer venting safety. When considering 2017 statistics documented by the National Fire Protection Agency —which found more than 15,000 dryer fires in North American alone—the extra attention is warranted. While the exhaust system code spans pages, one particular note about screens (highlighted bottom right) is particularly troubling for roof terminations. 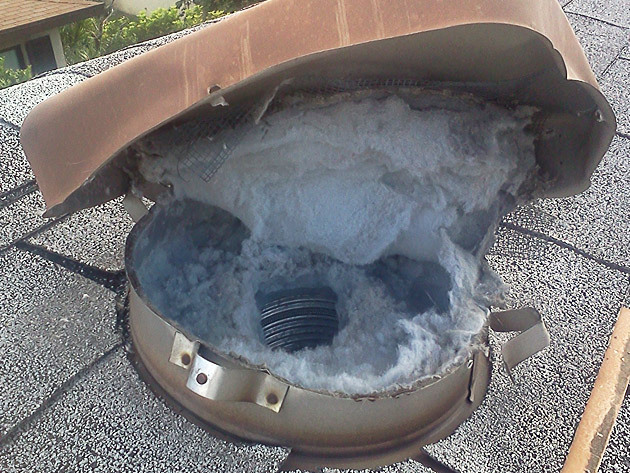 While screens are regularly included in most other vent caps to protect against pest intrusion, the lint that dryer exhaust carries with it creates lint buildup that other exhaust systems don't face. With the lack of good roof vent options, prior to the introduction of the DryerJack, many savvy contractors would simply remove the screen. 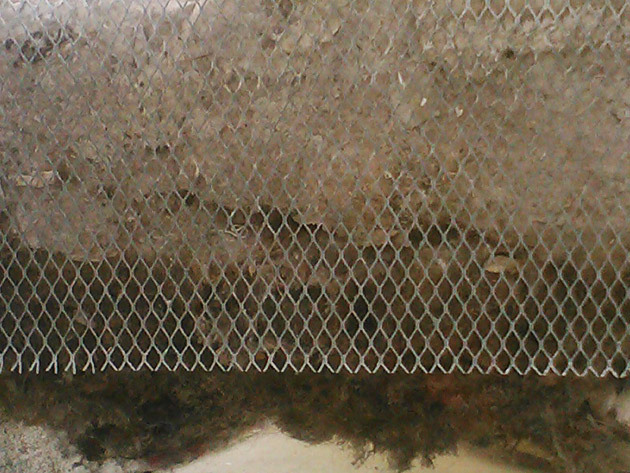 While reducing the fire danger clogged screens create, a lack of pest protection also creates problems. M1502.3 Duct termination. Exhaust ducts shall terminate on the outside of the building. 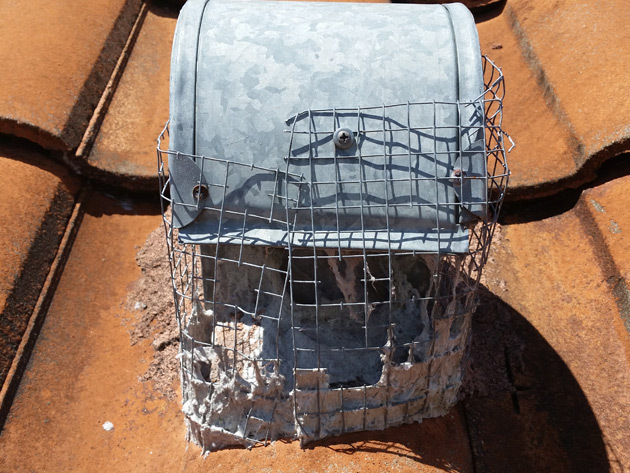 Exhaust duct terminations shall be in accordance with the dryer manufacturer's installation instructions. If the manufacturer's instructions do not specify a termination location, the exhaust duct shall terminate not less than 3 feet (914 mm) in any direction from openings into buildings. 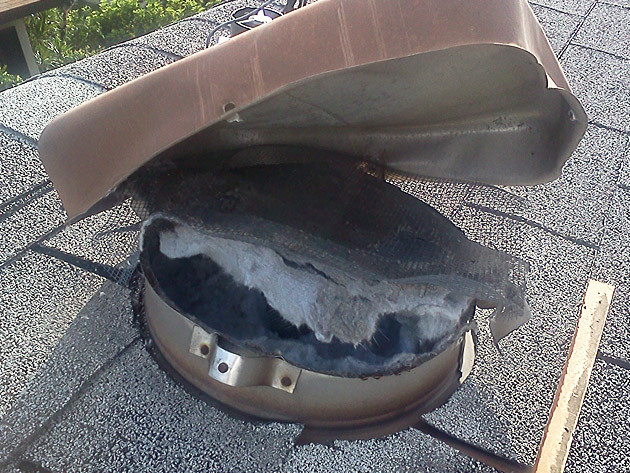 Exhaust duct terminations shall be equipped with a backdraft damper. Screens shall not be installed at the duct termination. 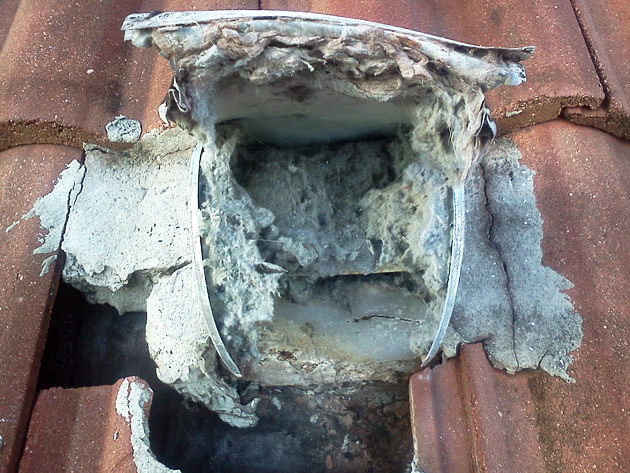 The images at left clearly show the importance of special treatment for dryer roof vents. The following code excerpts are actual International Mechanical Code where it addresses exhaust systems for the dryer. 504.1 Installation. Clothes dryers shall be exhausted in accordance with the manufacturer's instructions. Dryer exhaust systems shall be independent of all other systems and shall convey the moisture and any products of combustion to the outside of the building. Exception: This section shall not apply to listed and labeled condensing (ductless) clothes dryers. 504.2 Exhaust penetrations. Where a clothes dryer exhaust duct penetrates a wall or ceiling membrane, the annular space shall be sealed with noncombustible material, approved fire caulking or a noncombustible dryer exhaust duct wall receptacle. Ducts that exhaust clothes dryers shall not penetrate or be located within any fireblocking, draftstopping or any wall, floor/ceiling or other assembly required by the International Building Code to be fire-resistance rated, unless such duct is constructed of galvanized steel or aluminum of the thickness specified in Section 603.4 and the fire-resistance rating is maintained in accordance with the International Building Code. Fire dampers, combination fire/smoke dampers and any similar devices that will obstruct the exhaust flow shall be prohibited in clothes dryer exhaust ducts. 504.3 Cleanout. Each vertical riser shall be provided with a means for cleanout. 504.4 Exhaust installation. Dryer exhaust ducts for clothes dryers shall terminate on the outside of the building and shall be equipped with a backdraft damper. Screens shall not be installed at the duct termination. 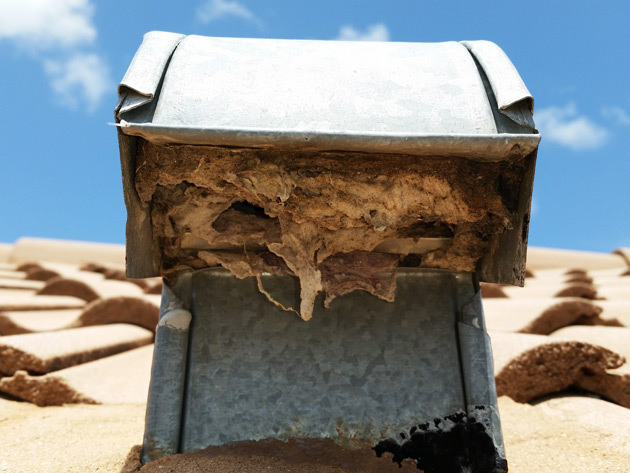 Ducts shall not be connected or installed with sheet metal screws or other fasteners that will obstruct the exhaust flow. Clothes dryer exhaust ducts shall not be connected to a vent connector, vent or chimney. 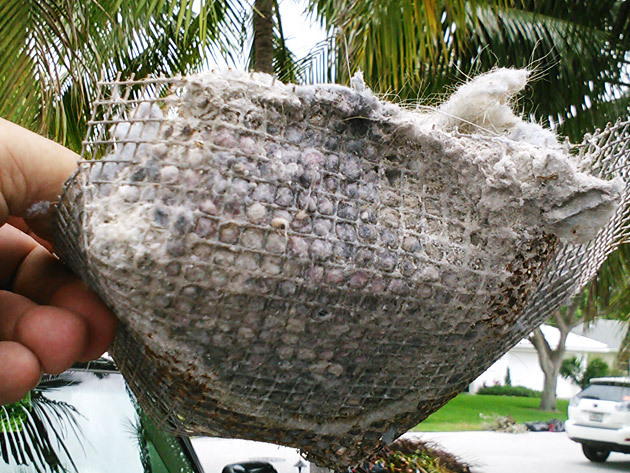 Clothes dryer exhaust ducts shall not extend into or through ducts or plenums. 504.5 Makeup air. Installations exhausting more than 200 cfm (0.09m3/s) shall be provided with makeup air. Where a closet is designed for the installation of a clothes dryer, an opening having an area of not less than 100 square inches (0.0645 m2) shall be provided in the closet enclosure or makeup air shall be provided by other approved means. 504.6 Domestic clothes dryer ducts. 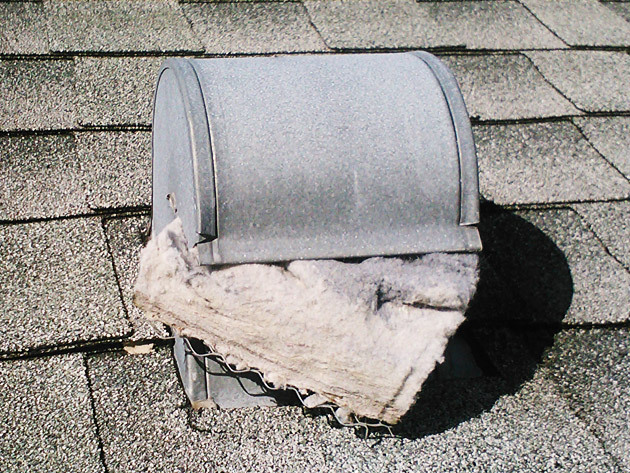 Exhaust ducts for domestic clothes dryers shall conform to the requirements of Sections 504.6.1 through 504.6.7. 504.6.1 Material and size. Exhaust ducts shall have a smooth interior finish and shall be constructed of metal a minimum 0.016 inch (0.4 mm) thick. The exhaust duct size shall be 4 inches (102 mm) nominal in diameter. 504.6.2 Duct installation. Exhaust ducts shall be supported at 4-foot (1219 mm) intervals and secured in place. The insert end of the duct shall extend into the adjoining duct or fitting in the direction of airflow. 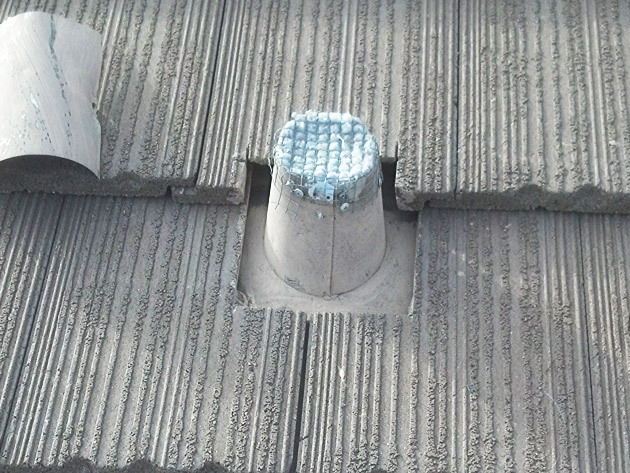 Ducts shall not be joined with screws or similar fasteners that protrude into the inside of the duct. 504.6.3 Transition ducts. Transition ducts used to connect the dryer to the exhaust duct system shall be a single length that is listed and labeled in accordance with UL 2158A. Transition ducts shall be a maximum of 8 feet (2438 mm) in length and shall not be concealed within construction. 504.6.4 Duct length. The maximum allowable exhaust duct length shall be determined by one of the methods specified in Section 504.6.4.1 or 504.6.4.2. 504.6.4.2 Manufacturer's instructions. The maximum length of the exhaust duct shall be determined by the dryer manufacturer's installation instructions. The code official shall be provided with a copy of the installation instructions for the make and model of the dryer. 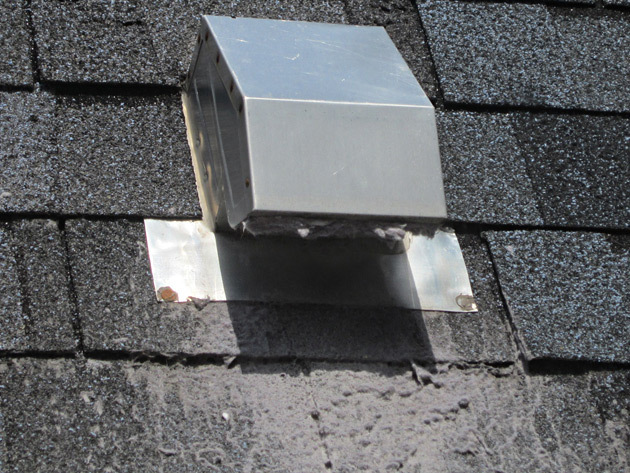 Where the exhaust duct is to be concealed, the installation instructions shall be provided to the code official prior to the concealment inspection. In the absence of fitting equivalent length calculations from the clothes dryer manufacturer, Table 504.6.4.1 shall be used. 504.6.5 Length identification. Where the exhaust duct is concealed within the building construction, the equivalent length of the exhaust duct shall be identified on a permanent label or tag. The label or tag shall be located within 6 feet (1829 mm) of the exhaust duct connection. 504.6.6 Exhaust duct required. Where space for a clothes dryer is provided, an exhaust duct system shall be installed. Where the clothes dryer is not installed at the time of occupancy, the exhaust duct shall be capped at the location of the future dryer. Exception: Where a listed condensing clothes dryer is installed prior to occupancy of structure. 504.6.7 Protection required. Protective shield plates shall be placed where nails or screws from finish or other work are likely to penetrate the clothes dryer exhaust duct. Shield plates shall be placed on the finished face of all framing members where there is less than 11/4 inches (32 mm) between the duct and the finished face of the framing member. Protective shield plates shall be constructed of steel, have a thickness of 0.062 inch (1.6 mm) and extend a minimum of 2 inches (51 mm) above sole plates and below top plates.